Special Antarctic Midwinter meal & launch New York Mar 30 – join us! One of the biggest events in the Antarctic calendar is Midwinter which celebrates the halfway point in the long polar night. It features 42 recipes developed by visual artist and cook Wendy Trusler while feeding volunteers on a remote continent uniquely devoted to peace, international cooperation and science. In a polar journal style, woven throughout are historic and contemporary images, food stories, recipes, journal excerpts and vignettes from Antarctica’s short history and this joint Russian-Canadian cleanup project. March 30th is not Antarctic midwinter in the Northern Hemisphere but it is Spring Equinox time here. That means it is also an opportunity to get together and share a meal to celebrate what has been in North America an astonishingly wintry winter thanks to the Polar Vortex from the Arctic and other ‘weather events’, a likely new reality across the world. 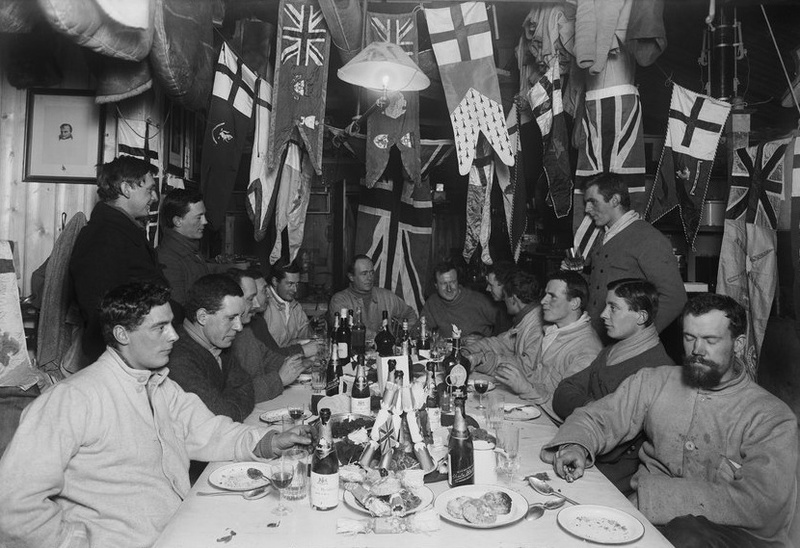 In early Antarctica expeditions many midwinter meals were a big celebration in June. Food was an obsession and this was the time to get out the finest existing amongst your provisions. The images from those times at the turn of the century show much food and bottles on the table. 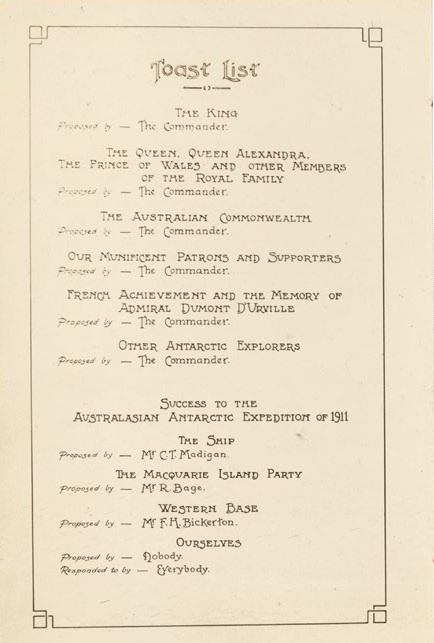 When possible, the Midwinter Dinner menus at times were extravagant, by Antarctic standards. Here are a few quotes from Midwinter dinners we collected while making this book. We’d even thought of how to adapt the Australasian Midwinter dinner for day (ocean-friendly fish and sans penguin eggs and who could find a turn of the century claret anyways). 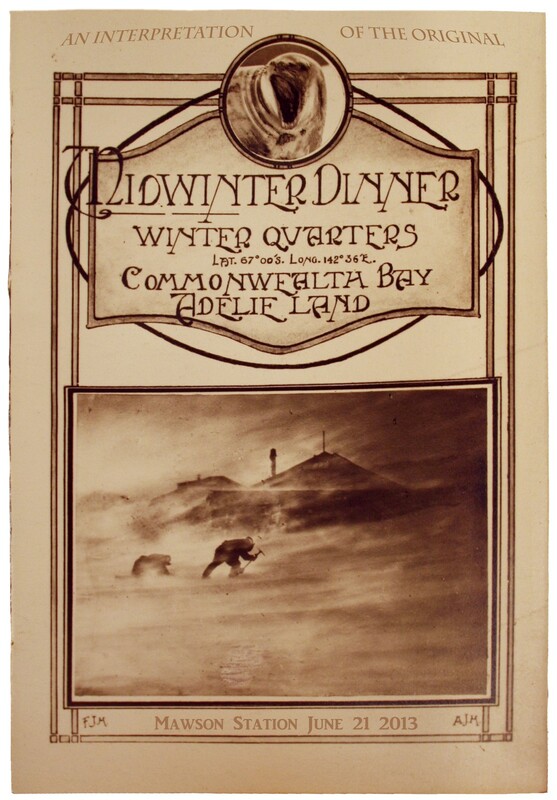 Frank Hurley photographed these elaborate, illustrated beautiful 1912 Midwinter menus. Thank you State Library of New South Wales for the images. “The history of the midwinter celebration stretches back as far as Neolithic times. For example, ancient archeological sites such as Stonehenge and New Grange appear aligned with the solar solstice. Midwinter festivals developed feast celebrations as people consumed the last of the fresh food and meat before the deep winter began. “The sun reached its maximum depression at about 2.30 P.M. on the 22nd, Greenwich Mean Time: this is 2.30 A.M. on the 23rd according to the local time of the 180th meridian which we are keeping. 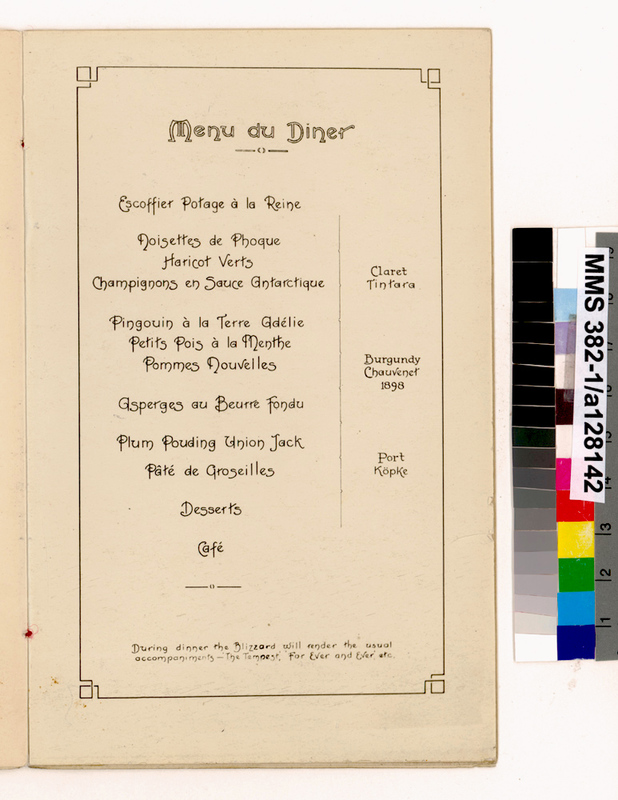 Dinner to-night is therefore the meal which is nearest the sun’s critical change of course, and has been observed with all the festivity customary at Xmas at home. At tea we broached an enormous Buzzard cake, with much gratitude to its provider, Cherry-Garrard. 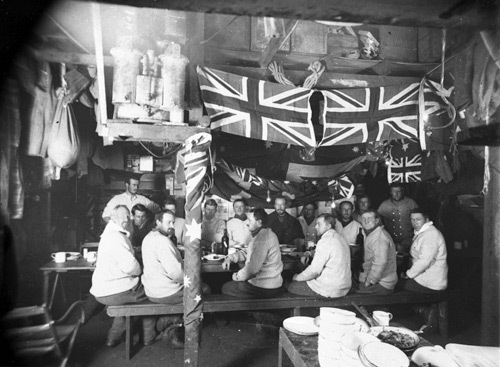 In preparation for the evening our ‘Union Jacks’ and sledge flags were hung about the large table, which itself was laid with glass and a plentiful supply of champagne bottles instead of the customary mugs and enamel lime juice jugs. At seven o’clock we sat down to an extravagant bill of fare as compared with our usual simple diet. Beginning on seal soup, by common consent the best decoction that our cook produces, we went on to roast beef with Yorkshire pudding, fried potatoes and Brussels sprouts. 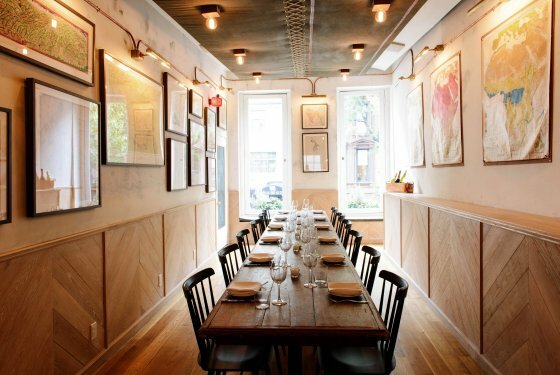 Then followed a flaming plum-pudding and excellent mince pies, and thereafter a dainty savoury of anchovy and cod’s roe. A wondrous attractive meal even in so far as judged by our simple lights, but with its garnishments a positive feast, for withal the table was strewn with dishes of burnt almonds, crystallised fruits, chocolates and such toothsome kickshaws, whilst the unstinted supply of champagne which accompanied the courses was succeeded by a noble array of liqueur bottles from which choice could be made in the drinking of toasts. We had come through a summer season and half a winter,and had before us half a winter and a second summer. We ought to know how we stood in every respect; we did know how we stood in regard to stores and transport, and I especially thanked the officer in charge of stores and the custodians of the animals. I said that as regards the future, chance must play a part, but that experience showed me that it would have been impossible to have chosen people more fitted to support me in the enterprise to the South than those who were to start in that direction in the spring. I thanked them all for having put their shoulders to the wheel and given me this confidence. Scott and the South Pole team unfortunately did not return home and perished only a short distance from a food cache. Cheers to all this nearly End of Winter March wherever you are North or Southern Hemisphere.